On the evening of Human Rights Day, a large group of people in Bristol were taken on a virtual detention tour. After cajoling the audience into closing their eyes, JP, a member of Bristol Refugee Rights, took us on a dark journey taken by many of their members, a journey into immigration detention. On stage with JP, I watched well over a hundred people, packed in a community centre under a picture of Malcolm X, close their eyes as instructed. JP’s softly spoken voice commanded you to imagine being someone with irregular immigration status. You go to a reporting centre regularly so that the Home Office can monitor your whereabouts. Suddenly, you are arrested. You are bundled into a van, which eventually takes you to what looks like a prison. It’s well past midnight. You are tired and scared. You don’t know where you are or what to do. You are shown into what looks like a small cell, with a bed, washbasin and a toilet. There are already other occupants there, who don’t speak your language. The metal door is then shut behind you and you are locked from outside. Overwhelmed by a sense of uncertainty and fear, you lose your appetite, you can’t eat any more. And you have no idea what is going to happen to you or how long you are going to be there. As I listened to JP with my eyes closed, I was reminded of the Unlocking Detention ‘tour’ that the Detention Forum has been running since September. Also a virtual ‘tour’, Unlocking Detention has been ‘visiting’ all of the sites of immigration detention by combining regular pieces on openDemocracy with regular tweets, selfies and blogs. The ‘tour’ destinations included Dungavel, the only detention centre in Scotland, situated in an isolated rural area, 45 minutes drive from Glasgow. The ‘tour’ peeked into the little known world of Short Term Holding Facilities, located at the border not very far from the airport lounge where holiday makers are waiting for their planes to take off. In prisons, we found forgotten immigration ‘detainees’ whose liberty is taken away long after they have completed their criminal sentences. Although it is often said that child detention has ended, some children are mistakenly classified as adults and can still end up in one of the detention centres. The aim of the ‘tour’ has been to bring immigration detention with no time limit and our varied experience of it to those who have the luxury of not knowing anything about it. Another purpose of Unlocking Detention was to generate more public interest in immigration detention as the first ever parliamentary inquiry into immigration detention was taking place. Immigration detention is a topic that even human rights, civil liberties or immigration NGOs tend to avoid talking about in public, at least in the UK. With the month-long tour finishing this week, has anything changed? One unintended outcome of the inquiry, which is yet to publish its report, has been a conceptual shift for those of us participating in it: it has become clear that detention does not stop at the gates of the detention centres, it continues to take its toll long after people have been released. This became increasingly evident as we and others collected evidence for the inquiry from communities in different cities and towns up and down the country. In the end, the inquiry received almost 200 submissions of evidence. There was a striking similarity in the sense of themselves of these ‘ex-detainees’. Detention, simply, seems never to leave them. The inquiry panel’s decision to place these voices of ‘experts-by-experience’ at the centre of their investigation was a wise one. During the three oral evidence sessions, these voices were often the most articulate and urgent, hammering in the inevitable message that this is not how we want our society to be. In the first oral evidence session, everyone in the parliamentary room gasped when one of the ‘detainees’ phoning in from Harmondsworth detention centre said that he had been detained for almost three years. Listening from the public gallery, I often felt that I had no words to respond to them. Their voices unwittingly encouraged a far more questioning attitude to the conventional wisdom that detention can be somehow made better, through training and better conditions in detention. Who could forget how, in the third oral evidence session, Her Majesty’s Inspector of Prisons, Nick Hardwick, asserted that no amount of improvements to conditions would be enough? His words were that ‘Even in the best run centre, with caring staff and effective management, the distress people feel is the uncertainty of their situation’. Citing indefinite detention, he insisted that fundamental changes, not tweaking, are needed for detention reform. Or how in the second oral evidence session, Dr Allen, previously of Colnbrook detention centre, argued that locking up and taking away hope from those who suffer from Post Traumatic Stress Disorder was a sure way to make their conditions worse. The Unlocking Detention pieces were also at pains to attack the fallacy that detention can be made okay. I learned during the preparation for Unlocking Detention ‘tour’ that Tinsley House detention centre, run by G4S, is often regarded as having good conditions and good ‘detainee’-guard relationships. The latest monitoring report by the Her Majesty’s Inspectorate of Prisons says that ‘Tinsley House is one of the best centres we have inspected’. In John’s case, however, this was no consolation. A case of unlawful detention and the breach of human rights was detailed in Jerome Phelps’ Unlocking Detention piece: a woman who came to the UK to join her refugee husband, only to be detained at the airport on arrival. She went on to be detained for seventeen months. An initially healthy woman, after months of detention her mental health had deteriorated to the point that she no longer had capacity to instruct a solicitor. Evidence of the harm of detention is so crystal clear that what is so shocking is not these tragedies but the fact that most remain silent on them. Even those who know what is happening inside and outside the detention centres are not quick enough to demand a fundamental change to the system, if not its outright abolition. In contrast to this clear evidence of harm and the clarity of the voices of ‘experts-by-experience’, everything to do with immigration detention policy remains opaque. The government has not been able to say exactly why it is has made plans to more than double the size of Campsfield House detention centre, even before the outcome of the detention inquiry is known, other than by vague reference to operational concerns. It makes little sense that the detention estate, which exists for the purpose of removing people from the UK, is growing, when the number of removals has been going down. Local activists, some MPs and some of us are now locked in a battle to stop this expansion. During the Unlocking Detention ‘tour’, however, we have seen a shift in community groups’ response to indefinite detention. 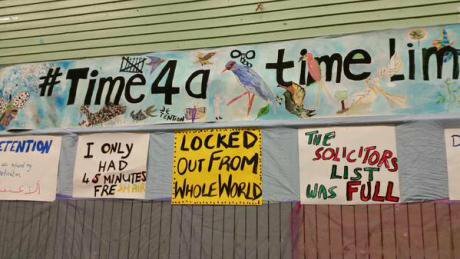 On 31 October, there was a vigil to remember those who have died in immigration detention and to call for a time limit on detention. The event was organised by CitizensUK, whose 2015 Manifesto includes putting a time limit on detention. The Sanctuary Summit on 15 November launched the Birmingham Declaration. Signed by hundreds of groups across the UK, one of its demands to the Government is that no one should be locked up indefinitely. We are now waiting to find out what kind of recommendations the inquiry panel is going to make on the issue of indefinite detention. In Bristol, JP’s soft voice concluded a journey into detention that had no happy ending. But when he asked us to open our eyes, we saw JP and his fellow members who had experienced detention standing tall under banners showing their demands. They were speaking up against detention, in the community, with the support and solidarity of others. 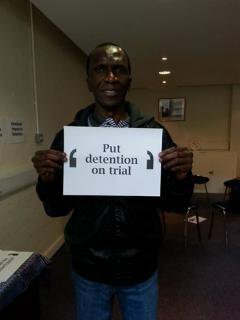 He reminded us that even on Human Rights Day, there were many who were still trapped in the detention centres. In Bristol, on Human Rights Day, something new was taking shape in our collective struggle for justice. Will the same happen everywhere else too? The Detention Forum would like to thank all its members who contributed to Unlocking Detention series. This is the final article in the Unlocking Detention series on 50.50 which has been running in parallel with the first ever parliamentary inquiry into immigration detention in Britain. The inquiry will report in February 2015.